Sunnyside Bench, Regular Route is one of the easiest multi-pitch climbs in the Valley. It is an awesome first lead due its varied climbing challenges (bouldering, face, chimney, off-width, corner, traverse) and gear placements (micro-cams to #4 Camalot). 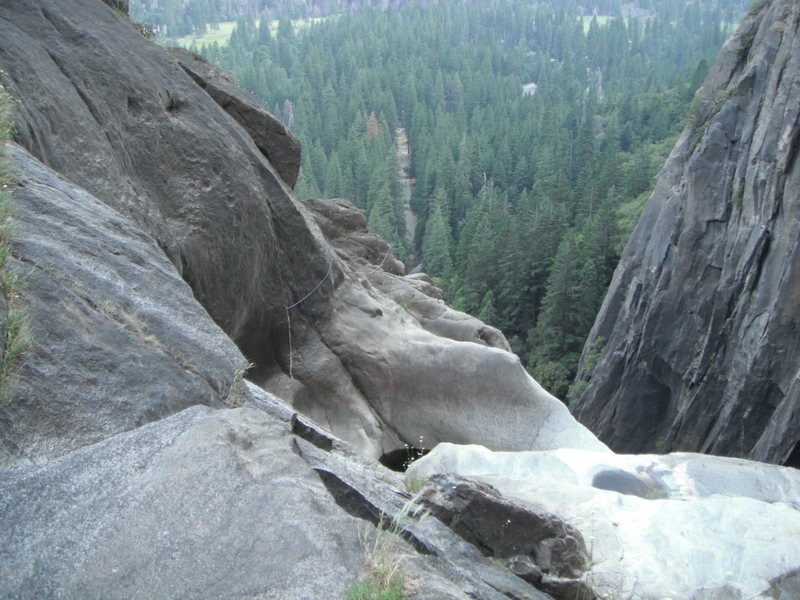 It also offers one of the most direct ways to the top of Lower Yosemite Falls. During the early season, watch out for running water on the 1st pitch and on the rappel down. Pitch 1 (5.2, 80'): From the end of the Class 3 section, rope up and climb into the squeeze chimney. This chimney is pretty narrow and may be hard to manage with a pack. Follow the chimney for 10-15' and go left over the flake. The wide crack on the left of the flake is probably the first spot where you can place gear (a larger cam). Continue up the crack until the big tree on your right. This is your anchor! Pitch 2 (4, 100'): From the 2nd belay station near the big tree, you will see the obvious gully that goes straight up the formation. DO NOT be tempted to go there. While it is climbable and not very hard, it is not the route you're here to do. It is unaesthetic and not very interesting. Also, early in the season it will have a lot of mungey wet spots. Instead traverse right and up, following obvious cracks. Climbing here is easy, exposed and very enjoyable. 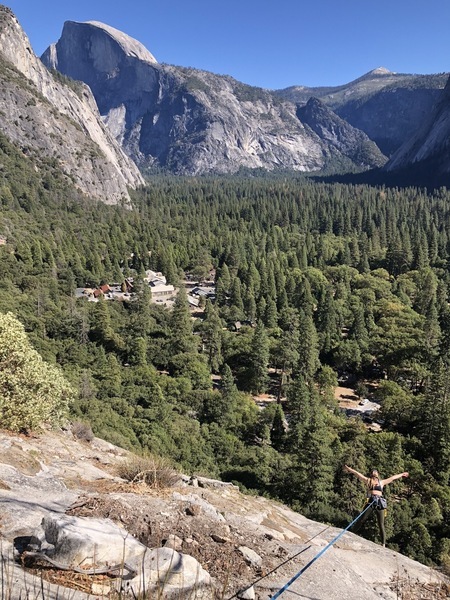 After negotiating a couple of headwalls, ledges and bouldering problems (aka "the tricky bouldering problem" in SuperTopo), you'll arrive at the 3rd belay station at another big tree. Pitch 3 (5.4-5.5, 150'): From the 3rd belay station you can see the first 80 or so feet of the 3rd pitch. At first you'll continue up an easy crack (4th class) to another tree. This will take you to the base of the crux. From here you can either go slightly to the right over 5.4 jugs (unprotected), or continue straight up into the 5.5 crack/corner, which is a bit too wide for hand jams, but still easy going. The well-protected corner is probably a better alternative to the run-out jugs, even though it is a little bit harder. Make sure to extend your placements with slings in this section. Once you handle the crux, you may be surprised to find a steep unprotected face right above you. Don't let it intimidate you and don't go that way, look to your right. You'll see a tiny ledge (1-2" wide) that extends across the face to a small tree. Follow that ledge until you are directly below that tree. If you experience a lot of rope drag, you can set up a belay station here. Follow the 5th class hand-crack above the tree all the way up until the easier ground. Use one of the larger trees for your anchor and enjoy the views! Descent: A couple of options exist here. You can continue up low-angle slabs for 250-300' until you find the climbers trail. Follow that trail to the right and down climb the gully to get back to the Valley. It will take you anywhere from 30 to 45 minutes to get back to the Lower Yosemite Falls trail. Though the trail seems to disappear at times, just keep going and don't lose faith. Another option will require three rappels down the obvious gully that you can see from your 2nd belay station. The first rappel station is located at the very top of that gully. To find it, look to the left as you finish the route. Bring your own slings to be safe, the ones I saw didn't look very good. on the left side of Sunnyside Bench, around the corner from Jamcrack, etc. Regular rack (one #4 cam is helpful but not essential) and some smaller pieces. a bit of the view. I give this a 5 star classic ratting if you make the trip to the pools. The walkoff, especially in its current, early-season state, is a strong counter argument to doing this route. Do you need two ropes to rappel? Did this route with my wife on July 28. When looking for a route in the morning on a hot summer day, this is a good choice -- the majority will be shaded, and all the belays have shade. As for the Pitch 3 5.4 face/jugs climbing variation, contrary to the info there are in fact protection opportunities where it matters -- Yellow TCU fits perfectly in a pin scar. While a tad runout (hardly), you plug the pro before the "crux" move so it feels very safe. I highly recommend going this way -- very fun. A fun solo. Cool views. Dang ants be all up in yo bidniss on the final crack. If for P3 you go left up a sorta flake ramp thing instead of right to the 5.5 crack or 5.4 face, there is a rapp station with two newish bolts/hangers and rings. This would deposit you in the gully you started up. The hike out isn't too bad. Then again, it's still technically winter so it may be a bit more bare than usual. Wow. First route ever in Yosemite. I printed the description and used it. A few tips to description above of 10' to 15' up the chimney. It's not feet. STAY IN THE CHIMNEY for about 100 feet. The tree will be right there. Sling it and bring up your partner. Head out to the exposed rock platform with nice holds and feel your jaw drop at the views of the valley. Head up past the manzanita and do the boulder move. The second tree is right there. Go up the crack with jugs and STOP when the crack ends. Nice foot hold on your right. Place pro in that crack. MOVE TO THE RIGHT. DO NOT GO UP THE EXPOSED AND RUN OUT FACE! It was terrifying. The team in front of us told me that I missed the slight traverse to the right that leads into juggy holds. Whoops. I made it though. 1st pitch is super easy. Avoid the loose looking boulder at the top by doing some chimney moves next to it and then going over to the left ramp. 2nd pitch is easy 4th. Next time i would solo it. Ends at a ledge with anchor opportunities (or continue up to one of the trees and belay). 3rd pitch is the best, it follows a 5.5 corner (a few stem moves) and finishes with a really cool and easy, but also exposed, traverse to another tree. If rope drag is bad or there are parties above you then make a belay here. However the belay is not very comfortable and your kinda hanging/standing on a small ledge. Finish of by climbing easy low 5th class cracks to the top of some slabs. Descend: climb exposed slabs (be careful, they're easy but a slip could be fatal in some spots) to the top and find a climbers trail heading right. This trail is covered in brush. Follow this trial until you reach an obvious gully. You will pass many drop offs with trails heading over to them but these drops aren't your exit points. Scramble down the gully to the main trail, turn right, and head back to the falls. You can also rappel instead of hiking around but we did not do this option. The descent was really sketchy - probably a combination of overuse, erosion, and drought. We roped up a few times - not because we were uncomfortable with the close, steep dropoffs - but because the loose dirt was unpredictable and small slides were happening all around us. In the future I'll be looking for the rappels on this route. Or rapping the route from trees. This is one instance in which rappelling may actually be safer than hiking. There are newish looking bolts that have been banged in (read: unusable) at the top of the last pitch. So we ended up going all the way to the top. Not sure this route is good for a new leader as it requires savvy when protecting (a lot of loose rock, a lot of dangerous placements that may look good) and route finding. A wandering route with plenty of opportunity to create rope drag. Also, the 5.0 slab at the top is sketchy because it is incredibly dirty and isn't protectable. Be very comfortable climbing slab when topping out on this route. Do the 5.5 variation (left-facing corner/crack system) for more pro and lots of fun! Felt right at home for this Gunks climber. I did this climb for the first time over Spring Break, and while the exposure was a blast, the stream running down the first pitch made for some sketchy placements. From the top of the route, try to veer right relatively soon to find the hiker trail back down, as the route beta we had led us up to the bottom off the slam beside the pools, and as a result a loose dirt and rock slide back down to the hiker trail. The route itself was great, especially after the first pitch. Nice views and pleasant climbing. If you're like me, and found the comments on descending pretty vague, here's hopefully a less vague description on getting to the lower falls pools and descending. From the top of pitch 3, you have the option of either topping out or keeping a keen eye out for the horizontal climber's trail that runs across the ascent (it's easy to miss if you're focused on climbing). -Topping out involves 250-300' of dirty choss scrambling upwards and is not very fun. Once you reach the top, hug the slab and go right down an obvious gully. At the bottom of this gully it turns into a downwards gully that goes to the cliff. Follow this down till you see the obvious climber's trail to the right, and take that trail. -If you were looking out for the climber's trail on the way up the choss, you should've spotted it in less than 100' of scrambling up. This is the same trail taken in the first option - if you are facing upwards, take this trail left towards the falls. It is pretty obvious the whole way, although there's a couple offshoot trails that dead end pretty quickly. Once you see the pools below, just walk down and slightly right across the slab, then sharp left near the bottom for an easy boulder downclimb. Time to enjoy cool, refreshing water and amazing views! -If you brought two 70m ropes, you can rappel down the falls from the station near the waterfall itself. -If you brought one 70m rope, you can walk back to the route itself, downclimb a bit and rappel from trees either down the way you came up, or sharp right over the cliff into the gully (this sharp right is from the top of pitch 3). There are some hidden-ish rappel rings in the gully as well. While this can be done with one 70m rope, we hit the ends of our rope twice and had to use some smaller trees as intermediate rappel stations, so I don't necessarily recommend this option. Awesome approach to the pools. And it's real climbing, which is hard to find at this grade: hand jams, chimneys, smearing traverses, and I even threw in a finger lock or two! The climb itself was only ok. But if you take into account the easy grade, it had nice exposure and continuous class 5 movement. I'm only an average climber and did it in approach shoes, 2 pitches from bottom to top with a 70m, in under 1 hour. As an approach to the pools at the falls, it was 4 star for sure. We had the pools to ourselves on a hot, sunny, day, and they were amazing and icy cool. The descent comments here seem to also be adjusted for the grade of the climb. If you've done other Yosemite approaches and descents, this was casual. Exposed 3rd class, but if you follow the cairns out PAST the talus field, switching back down to the talus field through trees, it isn't too bad. We descended in 20 minutes back to the Loop Trail behind the stables, and we were not hurrying. Maybe some of the commenters descended down the talus gully too soon? We did the route in 4 pitches to minimize rope drag. Walk off decent was super dry and easy to follow (October 2018, water is low). After you finish the final pitch you scramble up to meet a clear trail. If you head left, towards Yosemite falls you will get to the pools. Descent to the right - the trail meanders up and down a bit, then runs into a talus/boulder filed and meets down with main Yosemite Falls trail on the valley floor. 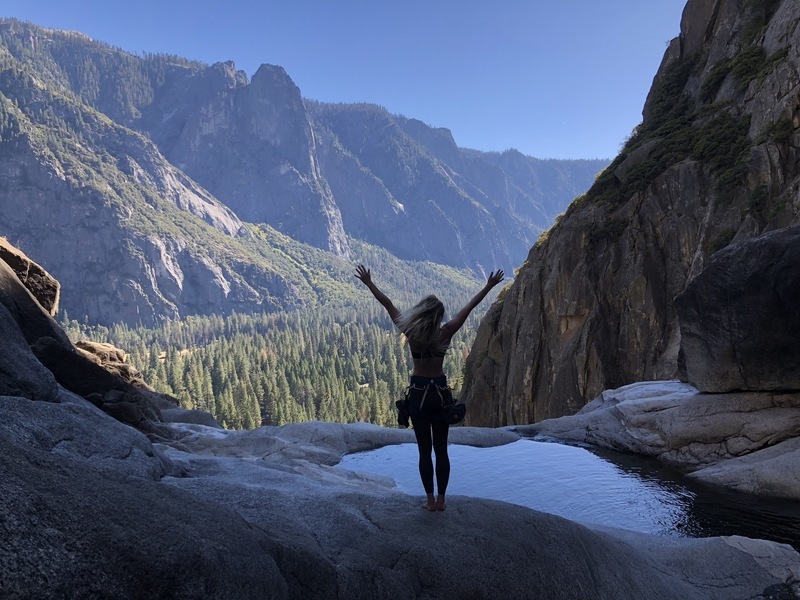 Awesome views and super cool pools at Yosemite Falls!Climbing was strait-forward with lots of protection available. Amazing views on top of Sunnyside Bench. Last Pitch. Taken in October, after the water is low. Yosemite Falls pools are so beautiful. A nice prize at the end of the climb. Climbing Jamcrack last weekend, two rocks came down directly onto the base of the climb. One was about the size of a golf ball and the other would have easily killed someone. Had people been in the wrong spot, I have no doubt that someone would have been seriously injured or died from rockfall. Based on the other comments at that climb, this seems to be a fairly common occurrence at Jamcrack — likely because of newer, inexperienced climbers dropping rocks on the upper pitches of this climb, which goes above the route. The winter storm in February knocked some trees down on this climb. The main belay trees are still alive, but some others fell on top of the route that have to be navigated and climbed through.